I'm am very happy to announce my latest iPhone game is now available for purchase on iTunes. 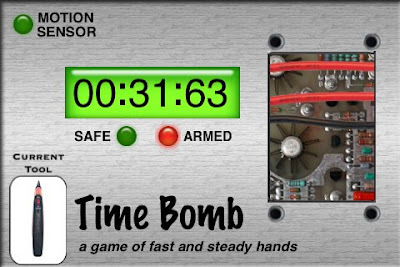 It's called "Time Bomb" and is basically a simple "beat the clock" dexterity game. You are presented with a time bomb and need to use your assortment of tools to deactivate it. Use a screwdriver to remove the access panel, then a probe to listen for the armed wires, and finally cut the proper wires to complete the job. The bomb settings are all customizable and the top ten times for each bomb type are saved. 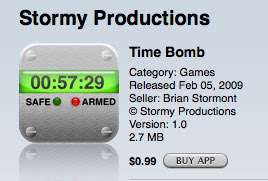 You can read more about it (and watch a really rough video demo) at the official web site TimeBombGame.com. This concludes this commercial interruption of my normal blog service. Thanks for reading! 12.69 seconds on hard. Beat that! Holy smokes Chris! That's a crazy time! I thought my score of 16 seconds was good. The next update (working on it right now) will allow you to email your scores to your friends and it will automatically insert the score into their copy of the game (assuming they accept your challenge and the score is a high score on their copy of the game). And, yes, there will be safeguards to prevent someone from faking a high score. The scores will have an official game signature that someone can't duplicate. Sounds good. Dano said he beat my time, but I'm not sure he's telling the truth, as he hasn't showed me his iPod. You've created a very addicting game! But what kind of professional?